In a normal Wi-Fi deployment all the access points are connected to the wired network. Why can’t we use the wireless network itself? That’s a lucrative idea. No wonder there are so many products claiming to do it. Performance is a totally different matter. The vendor may say it works since the web page did open eventually. Another vendor might say it works since you can connect to the Wi-Fi, nobody promised opening web pages. The customer may have expected to stream music or even videos over the network. To overcome performance problems some salesmen have recommended adding more APs. It is always a good idea to sell some more, isn’t it. In reality adding more APs may slow down the network even more. Did you say slow down? How come? What’s going on here? Let’s start with the simplest devices called Repeaters or Wi-Fi Range Extenders. A repeater is a device that just repeats everything it receives. It doesn’t care which way the data is going, the packet is just repeated like an echo. 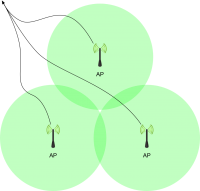 A repeater is placed on the edge of the coverage area so it can receive packets from the AP and repeat them to devices outside. Respectively the packets the outside devices send are relayed to the AP. A simple system, doesn’t require any additional settings and works as long as there isn’t much traffic. The downsides of repeaters could be visualized by imaging a conference room with a very long table. The table is so long attendees at the other end can’t hear what is spoken at the other end. This is solved by placing a parrot in the middle. The parrot will repeat everything it hears. This will slow down the communication, since after each sentence there has to be a pause to give the parrot time to repeat the last sentence. Each turn will take twice as long so the throughput is halved. The parrot will also repeat all sentences even if they were local only (will you pass the coffee, please). What if the table is so long you will need more than one parrot? The throughput will halve for each parrot. Since the parrots cannot listen and repeat at the same time, they have to wait for the next parrot to finish and so forth. Only after all are finished can the next sentence be passed. Normal Wi-Fi traffic between an AP and a user device requires only three addresses and that’s how the original 802.11 was written. If you are relaying packets you need all four addresses: transmitter, receiver, original source and final target. WDS adds the fourth address to 802.11 packets. Unfortunately WDS was never standardized to the last detail. Each vendor made their own solution which are mostly incompatible. In practice you can only expect WDS to work between devices of the same brand, since they need to understand each other. In this respect WDS is different from the repeater model, which doesn’t require any changes to the network. Four addresses provides for relaying a packet through multiple APs also known as multi hop. Each AP knows which clients it serves and it can even learn which clients are served by the neighboring APs. In practice the clients move and roam so it is safest to repeat all packets like a repeater. Since the APs need to send packets to each other they need to be on the same channel. This makes the whole network a single collision domain. Only one device can send at a time. This drawback and relaying the packets (the parrot!) will slow down the network considerably. The speed will halve for each hop. If the packet needs three hops to arrive at is destination, the speed will be just ⅛ of the nominal speed. Another problem with WDS is encryption. In ordinary Wi-Fi the client devices will authenticate to the APs. The devices thus have different roles. In WDS the APs would need to figure out the roles when authenticating to each other. The secure encryption methods will also change keys every so often, which will cause problems with multilateral authentication. For these reasons the original WDS networks were unencrypted or only supported weak WEP encryption. Later vendors invented their own solutions to implement WPA2 Personal (a.k.a. Preshared Key) but these solutions don’t interoperate. 802.11s was supposed to solve this but it hasn’t proven popular. Mesh is not standardized at all. It just appears that many vendors have their own mesh solution. Those are just basic WDS or with some improvements. The most popular improvement is to use a separate radio for AP to AP traffic. For example the APs can use 5GHz for inter-AP traffic while the client devices are only supported on 2.4GHz. This way adjacent APs can use different channels on 2.4GHz, but they still need to be on the same 5GHz channel. There are mesh APs with three radios. Two are for client communications and the third is for inter-AP traffic. This way the clients can be supported on both 2.4GHz and 5GHz and still use a separate channel for inter-AP traffic. This will improve the throughput as long as there is room in the 5GHz band. With multiple radios you will avoid the first halving of throughput. The AP can receive with one radio and transmit on another at the same time. Only if the next AP needs to repeat the packet the throughput will halve. These mesh solutions may also use 80MHz or 160MHz wide channels for inter-AP traffic. The 802.11ac’s wide channels have multifold capacity that will solve the halving of throughput to some extent. Without standardization the mesh solutions are proprietary. Mesh APs are typically more expensive, especially if they have three radios. You will also need to consider the AP density. In normal Wi-Fi the coverage cells of the APs don’t need to overlap. In a mesh the APs need to be able to receive each other well. This means halving the distance between the APs. You will need at least twice as many APs. Many vendors have their own point to point (PtP) and point to multipoint (PtMP) solutions. Typically the AP is integrated with a strongly directional antenna in a weatherproof enclosure. With these devices you can build a wireless backbone between the Wi-Fi APs. The backbone can have throughput comparable with a wired network. The solutions typically are proprietary with more efficient TDMA (Time Division Multiple Access) instead of 802.11 and may use totally different bands like 24GHz or 60GHz. A wireless backbone might sound like an overkill, but it is a viable solution with a reasonable price tag. For example on a campus with a few buildings a wireless backbone can be a better solution than digging trenches for fiber cables. In some historical environments digging is out of question or prohibitively expensive. A PtMP solution may be the least expensive way of distributing the internet feed from the main building to the cottages by the lake for example. Top notch gear for long distances are expensive of course. For a few hundred meters or a couple a kilometers you can set up a PtP connection for less than 200 euros. You need to add the Wi-Fi access point to that, because user devices can’t connect to a TDMA network directly. Always cable Wi-Fi access points if possible. An Ethernet cable is full duplex, error free and has superior capacity. If there isn’t that much traffic or users then you can supplement wired APs with mesh APs. You just need to be aware of the performance consequences. You should also consider the higher price of mesh APs. Could you use that money for cabling and end up with a better network? If you are forced to use meshing consider cabling as many APs as possible. The performance will improve as the hop chains will be shorter. If you need good performance but can’t install cabling, build a wireless backbone for the APs with PtP or PtMP connections. You nailed it. Please help spread the word! This was absolutely perfect. Thank you so much. Aside from the corporate domain I was wondering for the best approach for a big house. A wired AP in contrast to mash will not allow roaming as far I can tell. So I was wondering if there is a way to enjoy both benefits (speed due to cable, and roaming as with WDS/Mesh) ? Do you have an advice on that one ? Of course, assuming that property owner have access to all AP on property, their end devices will switch between network based on the best signal, but this does not sound like an elegant solution. Hope to learn something new. Roaming has nothing to do with how the APs are connected. The client device can’t tell if the APs are meshed or wired – and it is the client device that makes the roaming decisions. I am assuming here that the APs are really just APs. Most consumer devices contain a router, firewall, NAT, DHCP and Wi-Fi AP bundled together. Usually you can configure them as pure APs. You’ll want just one router/firewall/NAT in your network at the uplink and one DHCP server (which often is in the firewall). I don’t quite get what is your “inelegant solution”. To me it sounds like you are describing standard Wi-Fi roaming. That’s how it works. I am writing a specific article on roaming. I hope to get it out in November. Watch this space! By the way, I think it will be a good idea to cover moca and Ethernet over power line as a simpler solution to the Ethernet cabling part. Obviously this will not work in every setup, but it might be a good solution in some cases. Previous Previous post: How many users can one Wi-Fi access point support?